Branding your business can be an epic journey, full of creativity, transformation and excitement! But it can also be scary… confusing, even overwhelming. Creating something that represents the very core of who you are is a BIG DEAL. But it doesn’t have to be a scary one. Whether your business is online or offline, you need fabulous branding. If you’re a high street store you might need swing tags, merchandise stands and promotional posters. If you’re an online business you’ll probably need eBooks, social media headers and branded memes. Ready to elevate your brand and attract more of your ideal customers? Here’s how to build a beautiful personal brand without it taking up all your time, money and sanity! Your brand personality is something unique to you, it’s the way you feel, the way you act, how you speak, how you dress and much more. There is no right or wrong way to describe your brand personality. It’s about tapping into the internal blueprint that makes you who you are! Outlaws are free-spirited and fearless, they love to break the rules! Jesters are fun, playful and super entertaining! Citizens are honest, reliable and trustworthy. What you see is what you get! Innocents are simple, happy and natural. They want to make the world a better place. Heroes love to use their skills to solve problems. They’re bold, courageous and determined! Rulers love luxury, they’re powerful, refined and always in control! Nurturers are supportive, generous and caring. They have a genuine need to help others. So, what do you think? Are you a rebellious outlaw, a super fun jester, a daring explorer or a bit of all three? Once you’ve uncovered your brand personality it’s time to give it context, or in other words… what does your brand look like on the outside? It’s time to kickstart your creativity! Classic and Chic: Stylish, smart, smooth and timeless. Think bold or very bright colours! Casual: Think friendly and down to earth, subtle colours and simple patterns. Glamourous and Luxe: Are you a high-end brand? Dazzling refined and distinguished? Exotic: Light, bright and exciting! Exotic styles are eye-catching, fun and full of personality. Flamboyant and Arty: Fun, vibrant and dramatic! These brands are bubby and energetic. Romantic: Are you soft, gentle and feminine? A pretty, pastel brand could suit your perfectly. Edgy: Bold, punky and up-to-the-moment fashionable! Edgy brands mix dark tones with the occasional splash of colour. If you’re going to create a dazzling brand of your own then you’re going to have to get a little techie… This is the step where lots of ladies begin to come undone… say the words ‘graphic designer’ and it conjures up scary words like: CMYK, Dpi, bleed, crop marks and more! Keep the space between letters balanced. And the space between lines too! Choose fonts that can be read easily and come with a full set of characters – that means all the letters, numbers, grammatical signs and characters like pound signs and exclamation marks. NEVER use a hard to read font as your body copy. Choose your text alignment and stick to it. Left, right or centred! Only use justified text when it works well. In some cases, it can lead to huge spaces between your letters. Be creative! Mix and match your fonts to create interest and flow with your words. And finally, don’t be afraid to use bright, bold colours! Make-up: A brilliant place to look for colour combinations and textures. Hit a big department store and browse in the name of your business! Advertising posters: Think your local bus shelter can’t be a source of inspiration? Think again! Magazines: Magazine layouts and adverts are beautiful and designed to stand out! Grab a cuppa and flick through your favourite mag, using post its to highlight the pages that inspire you. Books: illustrated books, lifestyle books, even business books are often filled with fabulous photography, diagrams and drawings. Online: Search for logo design, colour combinations and specific themes (nautical, floral, 80’s) on Pinterest for heaps of inspiration or even Google images! Use your phone to take photos of things that inspire you, cut out pages from magazines or create an online mood board using Pinterest or Trello. The world is your creative oyster, go check it out! The right font can add flair, personality and character to your brand. But when it comes to choosing fonts, there are literally thousands of choices out there. Does it fit with my brand personality and style? Is it appropriate for my industry? Is it a classic font? Or fashionable and faddy? Does it make me feel good when I look at it on the page? Does it make me feel excited about using it? Think of your font like finding the right pair of shows to go with your outfit. You want your font to look fabulous, but it mustn’t overwhelm the rest of your branding ensemble! Step 6: Get creative with colour! Choosing the right colours is a super important step in creating your own brand. The right colour palette can bring your brand to life, build brand recognition and convey the perfect meaning to your potential customers. But with so many colours to choose from where on earth do you start? Which one suits your brand best? Whether you’re creating a header image for your blog or choosing an image for your next Facebook Ad, how can you choose images that stop your reader in their tracks, creates impact, drives emotion and encourages your reader to connect? Start by thinking about what attracts YOUR attention… what makes you pause when scrolling through your news feed? Use vibrant colours to attract your reader. Say no to dull, drab images and yes to bright colours and stand-out images. Use images that use your brand colours for extra points! Choose images that connect with your brand. If you’re a Massage Therapist you want images that fell calming, tranquil and relaxing. By contrast if you’re a productivity expert you want to look for clear, structured images perhaps with a clock element. And that’s that! 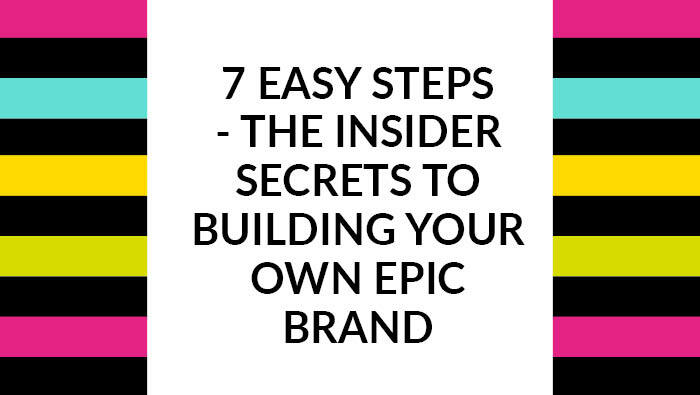 If you follow these seven simple steps you’ll be well on your way to building your own epic brand that resonates with your crowd and attracts your ideal customers! Want to DIY your brand from bland to beautiful? If you like the tips in this blog post, you’ll LOVE my online branding course Beautiful Brand Bootcamp! It’s packed with branding, design and visual styling tricks – not to mention tools, hacks and shortcuts – that will show you how to elevate your brand like a pro designer. The you’ll love Beautiful Brand Bootcamp. Come check it out here.